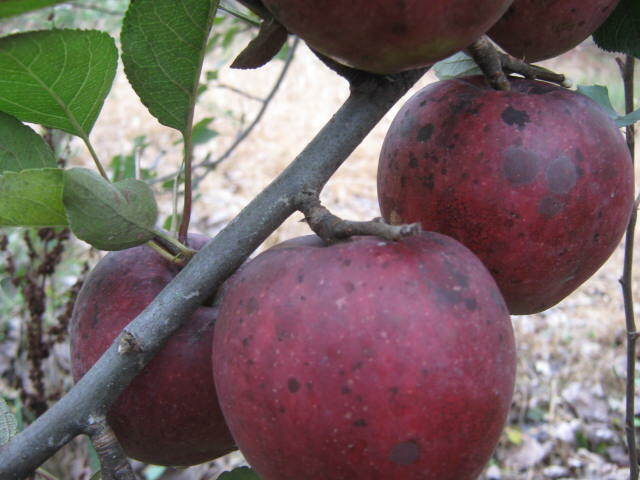 Minor surface discoloration was tghe only problem we had with our apples this year. I finally decided to close down the garden a few days ago. It is the third week of October after all. I’m hoping that the weather will stay mild so my cover crop of rye will germinate and make some good growth before winter sets in. Rye is not the same as rye grass. The most difficult part about planting rye is finding small quantities of seed. Here I have a one bushel bag of seeds weighing 56 pounds. Use a small broadcaster to spread half the seed in one direction then the remaining half cross-ways to get an even stand. I just finished digging the last of our potatoes this week. They were growing in a well-drained, sandy area so I was able to let them sit there in the ground for a few weeks after the vines died down. Since I couldn’t get to them right away, leaving them right where they were was the best option. A few weeks in the ground did them no harm. 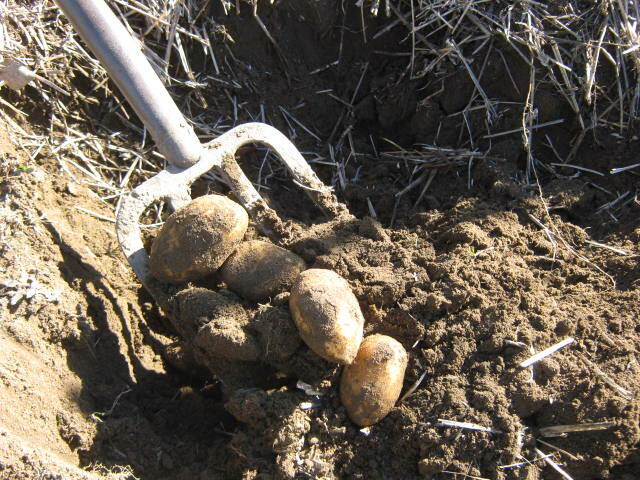 I’m always excited at potato harvesting time, it’s like digging for buried treasure. You can’t see what you grew until it gets dug up. The excitement starts when you lift the first cache of potatoes from the soil. It’s pretty neat that the humble potato can give such a thrill. I have to admit though, the excitement begins to wear a little thin when my back starts to ache and there’s still a long row to dig. These potatoes are particularly treasured, they’re the wonderful ‘German Butterball’ variety. They are absolutely the best potatoes I have ever tasted. The yield is small compared to standard potato varieties but the flavor and texture more than makes up for the smaller harvest. German Butterball potatoes are slightly smaller than our other potatoes. They are so tasty, that in years past, I’ve had raccoons dig them up and devour them while leaving perfectly fine standard varieties alone. They dug up the Butterballs, ate them until they were all gone but then never came back for the other potatoes. The flavor is hard to describe but trust me they will delight even those who are ho-hum about potatoes. And the texture — wow! You’ve probably heard that the perfect potato should be crisp on the outside and mealy on the inside. These go way beyond that. They tend to form a delicate outer crispness when baked in wedges. The inside texture is so finely textured, it is almost creamy. What a taste experience! Because of the comparatively low yield, I would not suggest growing this as your main crop, especially if you are trying to grow potatoes for storage. They do however, make a wonderful addition to the flavor palate of a vegetable garden. Now you know one of my best kept gardening secretes. If you have a favorite potato variety that you think is better than German Butterball, share it with us in the comment section below.